If we didn’t pass any additional legislation this year, we already have enough laws. The only annual obligatory bills are the ones that spend our tax dollars. Two Missouri senators already pre-filed resolutions to change the constitution so that the citizens will never be able to vote for a Lieutenant Governor who is not from the same political party as the governor. This appears to be a reaction to my candidacy for this office. 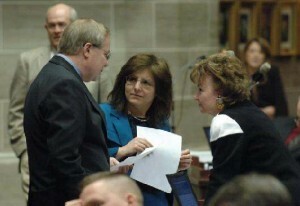 The entire eight years I was in the Missouri House, nobody ever questioned if the Lt. Gov. should be from the same political party as the governor. It is beyond coincidental that after I announce I am running for Lt. Governor, this suddenly is a concern for the Republican Party. Sen. Lamping said, “By combining the offices of governor and lieutenant governor, it encourages the two positions to work in tandem and accomplish more while hopefully being more efficient and fiscally prudent for the state,”. If efficiency were really his goal, he should have filed a bill that said all elected officials must be from the same party. Jay Nixon is not taking a position on this idea, but he said, “I think anytime you’re talking about taking away elective offices from the people you have to look at that very, very carefully. This year, I can predict with a great deal of confidence that big brother will continue to get bigger. You ask how I can be so sure, especially since we can’t afford the expense with economy worse than ever. I am certain of it because we have the same elected officials in office this year as we had last year and they grew government bigger. If our representatives voted for bigger government before, they have a proven philosophical leaning to do it again. The national congress said it is okay to detain American citizens without being charged for a crime for an indefinite people of time. The national congress, despite the majority claiming to be pro-life, agreed to give our tax dollars to Planned (anti-) Parenthood. The state legislature agreed to pass more tax credits to subsidize science experiments and warehouse space near the St. Louis airport. The state legislature prohibited teachers and students or former students from communicating on Facebook. What am I doing about the problem of government growing bigger? I am hosting the “Rally for A More Perfect Union” at the Capitol on Wednesday, January 4th. During this time, I will be explaining how and why to limit government. I hope you can join me, but if you can’t we will share some photos and stories of our success in a future edition of “State Talk”. I wish you a joyous New Year and urge everyone to stay constitutional! Does Anyone Have Property Rights?